Is Your Company Among 6 PH Firms Included in Forbesâ€™ List of the Worldâ€™s Best 500 Employers? Six of the largest companies in the Philippines are among the best employers in the world, according to US business magazine Forbes. In its first-ever listing of The World’s Best Employers, Forbes ranked 500 companies around the world that were most recommended by their employees. Its methodology included going through over 36,000 recommendations that asked employees how likely they would recommend their employers to others. The list is part of Forbes’ annual coverage of the Global 2000, or the 2,000 most valuable companies in the world. All together, the six Philippine companies that made the list employ over 171,000 people, according to Forbes’ data. All six of these companies are also among the largest conglomerates, banks and utility providers in the country. Diversified conglomerate Ayala Corp. was the highest-ranking Philippine company, coming in at 18th in the global list. 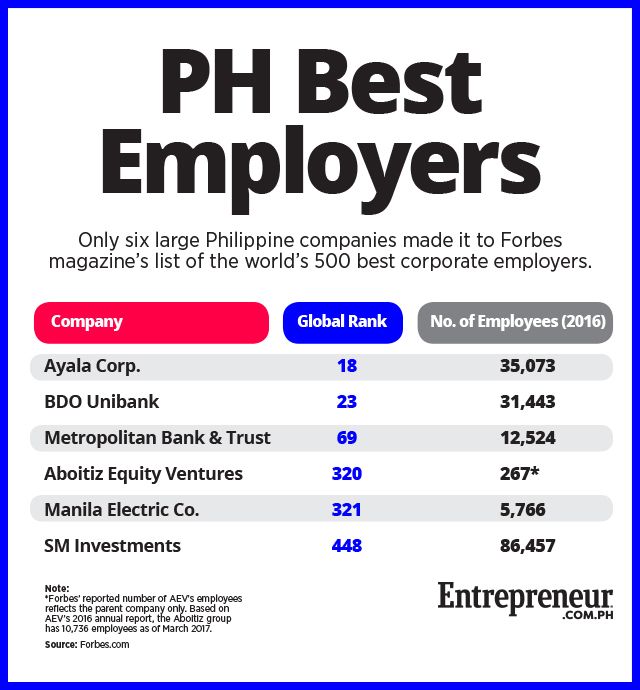 Not far behind is BDO Unibank, the country’s largest bank in terms of total assets, which Forbes declared as the 23rd best employer in the world. Both companies are also among the five best employers in Asia, ranking fourth and fifth respectively. Alphabet, the parent company of Google that employs 72,000 people, topped Forbes’ inaugural list of The World’s Best Employers. Fellow tech giant Microsoft and Japanese investment firm Japan Exchange Group completed the top three. The Philippines’ best employer has major businesses in the real estate, retail, banking and utility industries, with consolidated revenue reaching Php237.3 billion by end-2016. Significant chunks of its employee base are in financial services firm Bank of the Philippine Islands (BPI) and multinational technology firm Integrated Micro-Electronics Inc.
Ayala Corp. was the first company to be named Employer of the Year by the People Management Association of the Philippines (PMAP), winning the award back in 1977. A number of its subsidiaries have won the award since then, such as BPI in 1990, Globe Telecom in 2000 and Manila Water in 2006. In a survey by online job portal JobStreet.com released last August, BDO Unibank ranked sixth among the 10 companies “Filipinos aspire to work for” in 2017. It was the only banking firm to make the top 10. Related story: Who are the Country’s Most Preferred Corporate Employers This Year? Metropolitan Bank & Trust (Metrobank) has Php1.6 trillion in assets as of end-June 2017, the second largest in the country. The bank’s 12,500 employees make up a bulk of the employee base of its parent company, the George Ty-owned GT Capital Holdings. In the 2013 Retail Banking Awards of international magazine Asian Banking and Finance, Metrobank received the bronze award for Employer of the Year. Other local banks that have received the award include BPI and UnionBank, whose parent companies also made Forbes’ list this year. Aboitiz Equity Ventures (AEV) has subsidiaries in the power, food manufacturing and banking sectors. The holding firm reported revenues of Php116.4 billion in 2016. The biggest chunk of AEV’s conglomerate-wide employees are in the financial services sector, under universal bank UnionBank and remittance firm PETNET. But close to 3,000 professionals are employed in its biggest subsidiary, power and electricity firm AboitizPower. Meralco, the country’s largest power distributor, reported Php257.2 billion in revenue last year. It is one of very few companies to have won PMAP’s Employer of the Year award more than once, the first in 1980 and the second in 2012. As well, in the JobStreet survey on the companies Filipinos aspire to work for, Meralco topped the list in 2017, its first time being included in the ranking. It emerged as the most preferred employer among the 3,658 JobStreet.com users surveyed this year, beating out the Philippine arms of multinationals like Google and Nestlé. SM Investments is the country’s biggest holding company by market capitalization, with one of its subsidiaries, real estate firm SM Prime Holdings, being the first company to ever reach Php1 trillion in market cap. The conglomerate ended 2016 with Php362.8 billion in revenue and with the largest workforce of the six companies in this list. Aside from real estate, SM also has large businesses in the retail and financial services sectors, the latter being fellow best employer BDO Unibank. The company is owned by Henry Sy, the Philippines’ richest man for the past 10 years based on Forbes’ annual rankings.